This Persistence Market Research (PMR) report examines the ‘Global Automatic Tube Labelling System Market’ for the period 2018–2026. The primary objective of the report is to offer updates and information related to market opportunities in the global automatic tube labelling system market. This report covers the global automatic tube labelling system market performance in terms of revenue contribution from various segments. The report begins with an overview and definitions. The market viewpoints section underlines macro-economic factors influencing the growth of the global automatic tube labelling system market along with detailed opportunity analysis of the market. This is then followed by the key drivers, restraints and trends of the global automatic tube labelling system market. The global automatic tube labelling system market is segmented based on product type, end users and regions. Based on product type, the global automatic tube labelling system market is segmented into standalone and tabletop. Based on end users, the global automatic tube labelling system market is segmented into hospitals, blood banks, diagnostic laboratories, and research and development centers. Geographically, the global automatic tube labelling system market is segmented into North America (the U.S. & Canada), Latin America (Brazil, Mexico, Argentina and Rest of Latin America), Europe (Germany, France, the U.K., Italy, Spain, Russia and Rest of Europe), Asia Pacific Excluding China (India, Australia, Japan, ASEAN, South Korea and Rest of Asia Pacific), China and Middle-East and Africa (GCC Countries, South Africa and Rest of MEA). A detailed analysis has been provided for each region in terms of market size, Y-o-Y growth rate, absolute $ opportunity, and market attractive index. 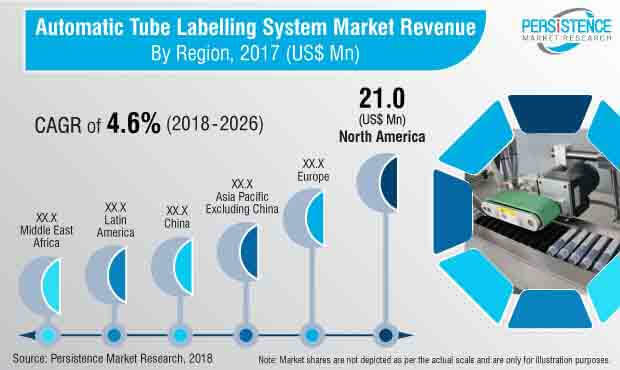 The forecast of the automatic tube labelling system market by country, product type, and end user is represented in a tabular form for each region. This section will help to understand the present scenario and opportunities of the automatic tube labelling system market in major countries by each segment. In the next section of the report, the ‘Competitive Landscape’ is included to provide the report audiences with a dashboard view of the key competitor firms in order to access the key differentiators among the competitor firms. This section is primarily designed to provide clients with an objective and detailed comparative assessment of product offerings and strategies of key providers specific to a market segment. The detailed profiles of players operating in the automatic tube labelling system market are also provided in the report, which highlight company description, product/segment overview, SWOT analysis, financial information, key developments related to market and strategic overview. The next section of the report highlights the market outlook for 2018–2026 and sets the forecast within the context of the automatic tube labelling system market by region. A detailed analysis has been provided for each region in terms of market size, Y-o-Y growth rate, absolute $ opportunity, and market attractive index. The above sections – by product type and end user– evaluate the historic market analysis and growth prospects of the automatic tube labelling system market for the period 2018–2026. We have considered 2017 as the base year and provided data for the forecast period. The final section of the report represents the global scenario of the automatic tube labelling system market along with y-o-y growth and market forecast till 2026. This section also evaluates the global market opportunity over the forecast period as well as the absolute dollar opportunity for each year. This section will help to understand the overall growth of the automatic tube labelling system market and the opportunity analysis for every year over the forecast period. To arrive at the market size, bottom-up approach is used to validate the total market size obtained for the automatic tube labelling system market. The forecast presented in the report provides total revenue of the automatic tube labelling system market over 2018–2026. PMR has used a triangulation methodology that is primarily based on experimental techniques, such as patient-level data to obtain precise market estimations for automatic tube labelling system market and insights on specific country/regions. The country-specific data is again analyzed to derive data at a regional level and then at the global level. This methodology ensures high quality and accuracy of information. The factors considered while developing the estimates of the automatic tube labelling system market are healthcare expenditure, automation expenditure, adoption of automatic tube labelling system, number of research and development centers and laboratories. The average selling price (US$) is derived by using weighted average pricing methodology. On the other hand, PMR has also analyzed the market by considering the revenue from the key players operating in a segment. The key players are segmented at the tier level with respect to their revenue, product portfolio and geographical presence. This process involves analysis of various annual reports of companies, investor presentations, SEC filings, 10k reports, earning call transcripts and press releases. This task is done to fetch substantial information about the key players, their respective revenues and estimate their respective market share. While forecasting the size of the automatic tube labelling system market, we have considered the impact of several factors such as per capital healthcare expenditure, disposable income, new labelling methods and automation adoption in healthcare industry across all regions, etc. However, quantifying the market across the aforementioned segments and regions is more a matter of quantifying expectations and identifying opportunities rather than rationalizing them after the forecast has been completed. In addition, we have taken into consideration the year-on-year growth to understand the predictability of the market and to identify the right growth opportunities in the global automatic tube labelling system market. Labelling is a standard procedure to provide the consumer an insight of the manufacturer's proprietorship and customary product details. Automated labelling is done to label any product and is currently utilized by factories and industries worldwide. The machines used to stick labels on the test tubes are known as tube labelling machines or systems. An automatic tube labelling system offers different labelling options for use on test tubes. Automatic tube labelling systems are basically used in the field of chemistry, hematology, virology, genetics, DNA sequencing, forensics, drug discovery and other related fields for labelling and tracking samples. The automatic tube labelling system provides precise placement of pre-printed labels and eliminates the need for a manual or hand-apply process by offering fully automated features. They are designed to eliminate human errors, enhance productivity and to facilitate the workflow in the lab. The automatic tube labelling systems offer different labelling speed, can apply label of different sizes and shapes, and they have a feature of integration with the automation system. The global automatic tube labelling system market is projected to grow at a CAGR of 4.6% throughout the forecast period (2018–2026). The standalone was the dominant product type segment in the global market in 2017, with nearly 72% market share. The global automatic tube labelling system market is expected to be driven by increasing demand for automation in laboratories due to shortage of skilled professionals. The strict guidelines for labelling sample tubes as well as reduced identification errors are factors expected to boost the demand for automatic tube labelling system. The Clinical and Laboratory Standards Institute, CSA Group, World Health Organization (WHO), and European Federation of Clinical Chemistry’s Laboratory Medicine have established and support strict guidelines for labelling specimen tubes. Automatic tube labelling systems increase the productivity, reduce errors and costs, and increase control over lab workflows. These benefits are expected to drive the growth of the automatic tube labelling systems market. Drug development companies looking for a high output environment, which supports thousands of labels a day, are opting for automatic tube labelling systems, as they help in achieving tremendous cost savings with high productivity. In fact, automatic tube labelling systems provide various benefits, such as labelling accuracy and reduced downtime. These factors are expected to drive the growth of the global automatic tube labelling systems market. Increasing demand for laboratory automation to enhance patient services is expected to create a huge demand for automatic tube labelling system. The key players are focusing on the development of new labelling systems to meet the needs of scientists and researchers. This factor is expected to drive the growth automatic tube labelling market over the forecast period. However, small R&D centers, laboratories, blood banks, and hospitals mostly prefer the conventional method for tube labelling or semi-automated labelling systems, which is expected to restrain the growth of the automatic tube labelling systems market over the forecast period. The global automatic tube labelling systems market is segmented into six key regions, namely North America, Latin America, Europe, and the Asia Pacific excluding China, China, and the Middle East & Africa. North America is expected to be the most lucrative market for automatic tube labelling systems, followed by Europe and Asia Pacific excluding China. North America is expected to dominate the global automatic tube labelling systems market due to the presence of a large number of research and development centers and high adoption of automation in the healthcare industry. Europe is expected to contribute second large revenue share in automatic tube labelling system market due to increasing adoption of automation in European countries such as Germany, France, and the U.K. The Asia Pacific excluding China automatic tube labelling systems market is projected to exhibit significant growth over the forecast period due to increasing R&D activities in countries such as India, South Korea, and Japan. The China automatic tube labelling systems market is expected to grow at a high CAGR over the forecast period due to increasing number of local Chinese players. Examples of some of the key players identified in the global automatic tube labelling system market include Scinomix Inc., ALTECH Srl, Brooks Automation, Inc., PaR Systems, Inc., BioMicroLab Inc., Computype, Inc., Auto Labe, California Advanced Labeling, Inc., HTI bio-X GmbH, and Capmatic Ltd. The global automatic tube labelling system market is highly fragmented with a large number of domestic players.